Before we begin — this is a trailer for a fan made, directed and pro­duced movie “Phil­an­thropy”, it is not the offi­cial film, the pro­duc­tion qual­i­ties on this effort are far supe­rior to the major­ity of fan ded­i­ca­tions to be found on the net and this should be recog­nised. A lot of peo­ple mis­in­ter­preted the first trailer. The first and most impor­tant thing to note: this video is fan made and is not in any way an offi­cial movie pro­duc­tion. 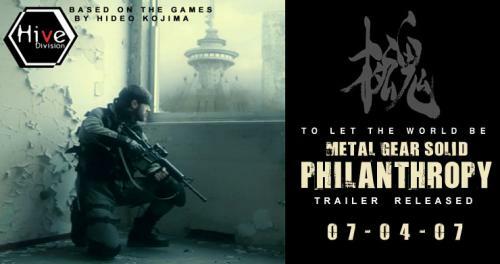 Phil­an­thropy is a well organ­ised live action effort to pro­duce an MGS movie and this, the trailer for which, is the fruit of their offerings. I have taken the time to include this movie here because it illus­trates the poten­tial that an offi­cial Hol­ly­wood live action adap­ta­tion can achieve, when such high stan­dard fan-made work can be cre­ated with the lowli­est of budgets. “After a full year’s efforts, a year full of patience and growth, The Hive Divi­sion is happy to share with all of our Inter­net friends the first trailer of Phil­an­thropy. The project has been a part of our lives for more than four years, and in those four years, the aims that it rep­re­sents and the dreams that it embod­ies have grown along­side us.